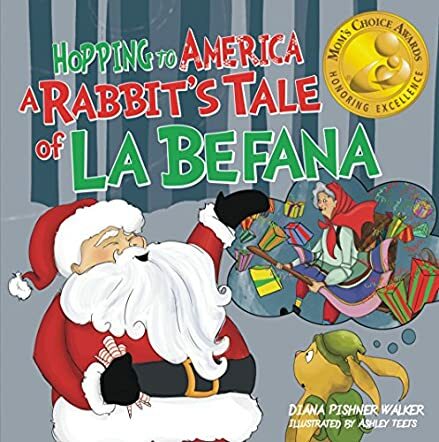 Hopping to America: A Rabbit’s Tale of La Befana is a children’s picture book written by Diana Pishner Walker and illustrated by Ashley Teets. After moving from Italy to America, the Riepule family wonder what surprises lie in store for them. They quickly discover other Italian-Americans living in America, all of whom continue precious Italian traditions including that of Epiphany with La Befana. With Christmas fast approaching, Mamma Rosa prepares merry gifts for the festive occasion. Her oldest son, Joby, fears going to the well for water as he knows that Fox Gregory will be watching, but after Nonna catches the fox stealing gifts from them, an agreement is reached which is beneficial for all. I quite enjoyed the upbeat story in Hopping to America: A Rabbit’s Tale of La Befana. Diana Pishner Walker’s tale of two different traditions which belong to two different countries, but are held close within the hearts of the Italian-American immigrant families, enlightens me about the different cultures around the world. While immersed deep within their own culture, unwilling to leave it behind, the Riepule family wholeheartedly embraces the new celebration of Christmas with Santa Claus rather than shirking it and pushing it aside. The teaching of selflessness, gift-giving and being charitable towards others is the very strong message which I took from this story and it left me with a smile. I wholeheartedly recommend Hopping to America: A Rabbit’s Tale of La Befana to all young children aged 5-12 who are living in America, regardless of their backgrounds, so that they might also learn to embrace the culture of their immigrant friends.